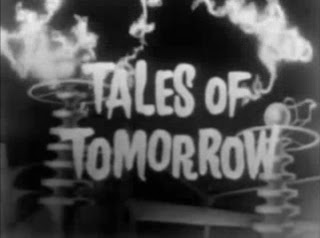 The science fiction anthology series Tales of Tomorrow ran from 1951 to 1953, and was the first TV show of its kind. The brainchild of Theodore Sturgeon and the Science Fiction League, the published stories of the SF League's illustrious members were made available for adaptation. The stories may not seem so cutting edge today, especially since many have been retold on television a number of times. But at the time the series originally aired, the Golden Age SF stories they were based on were still relatively new. I've listed a few of the tales featuring futuristic takes on the medical profession below. Sure, the doctors are all middle-aged white men - what sets them apart from the "present-day" of the 1950s is novel technology and science, not noticeable changes in society. Also, women apparently ruin everything. If you like classic SF and old-time TV, they are worth watching, if only to see the way the future looked a half century ago. The episode is based on the story of the same name by Cyril Kornbluth, which was originally published in Astounding Science Fiction in 1950. This episode was adapted for TV by Theodore Sturgeon from Stanley G. Weinbaum's 1935 story "The Adaptive Ultimate". This episode does not seem to be based on a previously published story. Synopsis: A neurosurgeon who lacks confidence finds himself leading the operative team performing brain surgery on an important physicist. A pair of special glasses given to him by a mysterious stranger helps see him through. This one seems to be more a tale of magic than science. Synopsis: Boris Karloff stars as a physician who invents a time machine to travel back in time to try to get rich selling penicillin to a pharmaceutical firm. Will he be successful? Could his wife ruin everything? So there you have it: two hours of old time SF TV. You can watch most of the series episodes at the Internet Archive and Hulu. And the collection is available on DVD at Amazon.com and other retailers.